Exciting news from Sante Total! 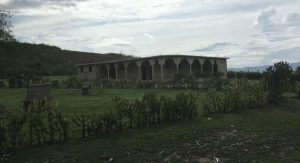 As many of you know, we are working to construct a permanent clinic building but are still short on funds. A very generous anonymous donor has agreed to match up to $25,000 towards finishing the building. Please consider donating to the building fund so we can finish the inside of the building and get the clinic staffed and running! You can make your donation via Paypal on the home page or mail a check to Sante Total c/o E. Alton Sartor at 1511 Dufossat Street, New Orleans, LA, 70115. We will be growing the building fund over the next couple of months with the goal of starting construction after the next rainy season. When the clinic is finished it will be an 11 room building with individual exam rooms, observation wards for critically ill patients, a pharmacy, a laboratory, and most importantly, electricity to run the medical diagnostic devices that are considered essential in American hospitals: an EKG, an ultrasound, a microscope, and lights to examine patients past sunset. Once this basic goal is met, the clinic will only continue to grow in its functionality, and Alison Smith, the founder of Sante Total and a future surgeon, dreams of one day completing a functional operating room. In the meantime, the clinic will serve as a pharmacy and dispensary when the medical missions are not present, and a local person will be trained to dispense medication to those in need.